Lots of people complain about dense meeting schedules and overflooded inboxes. Yet, few people try very hard to find the root causes or to explore better ways of working. Instead, time and energy is wasted on blaming the tools, asking for more disk space, and sorting emails into folders. In a work environment where our work is more or less invisible (digital), we tend to see the symptoms of our inefficient practices (such as full email inboxes and meetings all day long) as evidence of hard work. Few executives and managers pay these things much attention, and the ones who do often seem to think that investing in new technologies will make the situation better. Although technology is an important ingredient, there are some even more important ingredients in any recipe for achieving smarter ways of working together; people, their needs, their attitudes and behaviors, and the situations they find themselves in at work. It is high time for organizations to take productivity and collaboration tools for what they really are: tools that enable people to work smarter together. It might seem as common sense, but if you take a quick look around, you will find plenty of organizations where this kind of common sense isn't put into practice. In fact, technology-centric thinking prevails in most organizations; any new technology, product or feature that is implemented is perceived as a silver bullet that will solve automagically solve a bunch of problems once deployed. What these organizations fail to acknowledge and act upon is that real and sustainable business improvements come from continuous efforts aiming to improve ways of working, not from throwing a set of new tools or features at people every now and then. 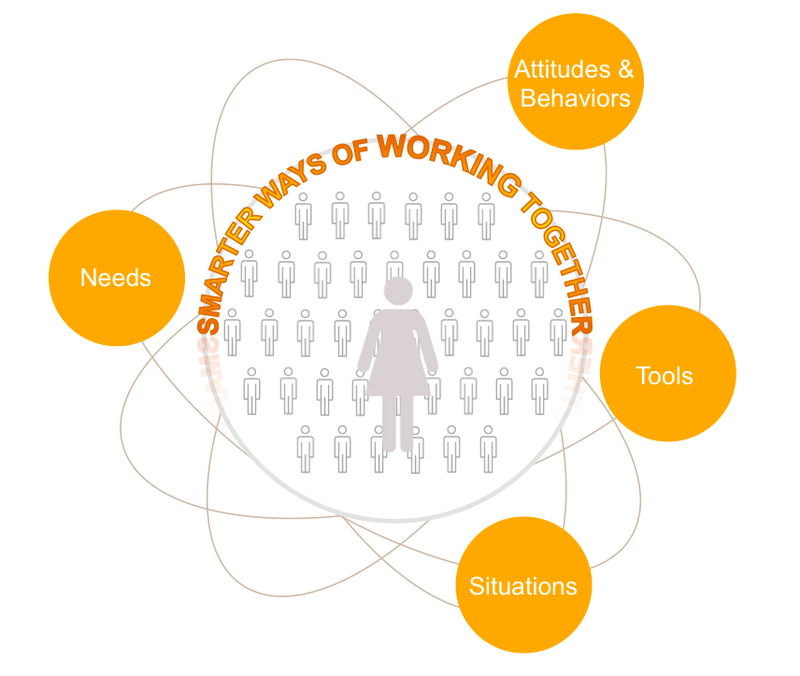 Ways of working cannot be improved if you don't have people as your starting point - understanding their needs, attitudes and behaviors, and the situations they find themselves in. After that, you can add the technology ingredient.